CASERTA, A LANDMARK IN THE FRANCIS REVOLUTION - Although many things happened in August, such as the papal trip to Seoul, I decided to analyze Francis' visit to the Evangelicals in Caserta on July 28, 2014, and the speech he delivered on that occasion. I believe that in many ways Caserta sets a landmark in the Francis Revolution that needs to be emphasized. My intention is not to accentuate the significance of the visit of a Pope to another temple of a Protestant sect (this one still under construction), because unfortunately these visits have become a gloomy and grimy routine for the post-conciliar Vatican. Indeed, after the first visit of John Paul II to the Lutheran temple in Rome in 1983 to pay homage to the 500th anniversary of Martin Luther’s birth, the Conciliar Popes have spared no effort visiting all kinds of heretical, schismatic, Jewish and Muslim edifices of false worship. So, Francis’ visit to the Evangelical/Pentecostal temple in Caserta falls into the same progressivist agenda of building a Pan-religion. My intention here is to unfold some consequences of the condemnation he pronounced against those who acted in the past against Evangelicals specifically, and all Protestants generically. 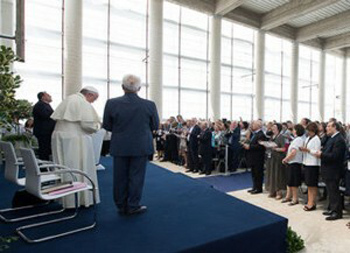 Now, when we take into consideration that the Church convened the Council of Trent precisely to denounce the errors of Protestantism, we see that Francis in Caserta inaugurated a line of attack against an entire era of the Church’s history. Today we have Francis preaching a Tolerant Church that has nothing to do with that pure and immaculate Bride. Instead, the Conciliar Church could be defined as having in herself all the errors and stains of the false religions with which it is entering into relationships of ecumenism and dialogue. These observations regarding the speech as it was disseminated by the Vatican organs of press do not reflect, however, the whole reality of what happened at Caserta. "Catholics who accused Protestants were possessed by the Devil"
The Vatican organs were very quick to distribute the censured version and avoid this embarrassing statement. Most of the press, already accustomed to the constant “corrections” of what Francis said, changed their reports accordingly. Some Catholic organizations, however, kept in their news reports the “possessed by the Devil” of the original speech; the reader can check, for instance, the early reports made by Gloria TV and the Eponymous Flower Blog. Hence, the commentary I made above on the Vatican-reported speech should be greatly augmented in its gravity when we consider the original intent of the present day Pontiff. He actually meant to state that not only Catholics of the ‘40s who had persecuted Evangelicals – but also any Catholic in the past including St. Pius V and the Council of Trent, for example – were possessed by the Devil when they issued condemnations against Protestantism. 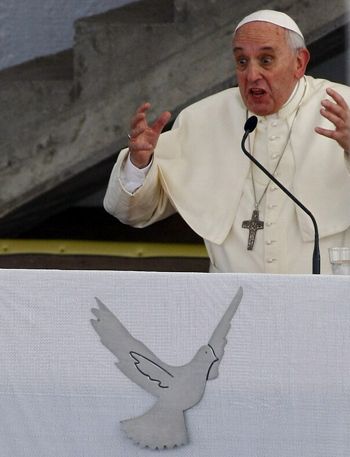 Although the Pentecostals of Caserta were very enthusiastic about Francis and his radical statements favoring Protestantism, other organizations of the same sect issued public messages of protest against what happened at that meeting. To conclude, I point out that Caserta is a landmark in the Francis Revolution. Until then he made many attacks against traditionalists, presenting them as “pelagians” “ideologues,” “obsoletes,” etc. He also made some general attacks against the previous Church teaching based on principles, which Francis confusedly called “idealism” and “nominalism.” With these attacks he indirectly targeted almost all the Saints of the past. I believe that Francis’ words at Caserta may be the bugle sounding a general cavalry charge against the militancy of the Church, identifying it as a work of the Devil. The consequence: Whatever was from the Devil until now becomes holy; whatever was holy becomes a work of the Devil. It is a complete revolution in the concepts of good and evil.